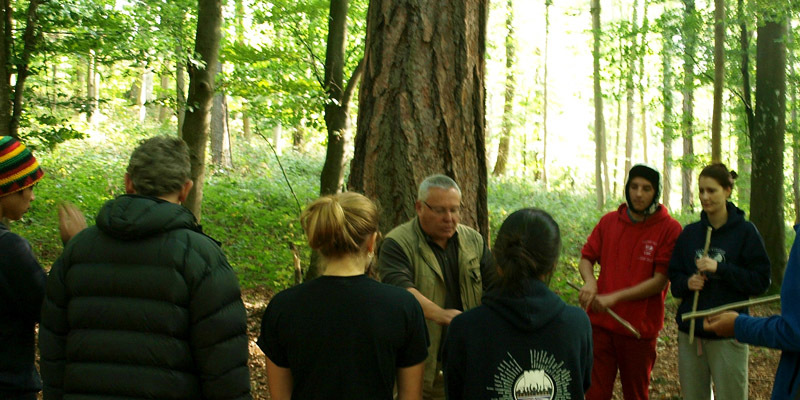 Forest School & Bespoke courses. We presently deliver a variety of courses for Schools, Scouts and Companies. We can design a great experience to suit your desired learning outcomes. Contact us for an informal discussion about course content and costs. Wellies or walking boots; midge repellent; warm, dry and waterproof clothing, preferably old stuff, sleeping bag and ground mat; mug, water bottle and at least your own spoon. You may bring your own tent and other camping equipment. We will provide waterproof sheets to enhance your shelter and all knives and tools. When requested we can also provide some local sausages and pitta bread for BBQ suppers. Tea and coffee are always available. We do not usually cater for special dietary requirements but can offer support and advice. You must notify us of any medical conditions. These are wilderness immersion courses so our hygiene and toilet arrangements will reflect this. Ask! Groups: usually eight to 10 persons including your own qualified teacher or youth leader. Overnight cover by Biblins staff may be required depending on group and the experience of your attending staff. Family: typically two parents/legal guardian and their two children. Overnight cover is usually obligatory for insurance reasons and cannot be discounted. Don’t hesitate to get in touch to find out what we can do for you.